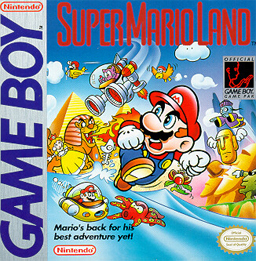 Look at the cover art for Super Mario Land. I got Super Mario Land in the post around 14:00, I had completed it by 14:30, on my first playthrough. A mysterious alien called Tatanga appears, and hyponotises the denizens of Sarasaland. He kidnaps Peach Daisy, and Mario goes about his day job of plumbing princess rescuing through the 4 worlds of the Sarasaland Kingdom. I always thought Daisy was a Luigi “thing”, never knew she debuted here. Played a 2d Mario? Then you know what to do, run right, jump over/onto things, get to the end. So far so Mario. 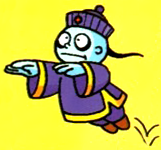 No Standard Koopers, instead you get bomb turtles called Nokoban. The submarine and plane levels, 2-3 and 4-3 respectively, are pretty cool and change the gameplay up alot. For this reason alone I’ll add 25 points to the score. Each world is themed, you get an Egyptian themed world complete with Pyramids called Birabuto. Muda is themed on the lost continent of Mu near Bumuda, so contains lots of caves, and underwater sequences. Easton is a barely disguised Easter Island. Each world is short, and contains many repeating sections. There are also many checkpoints on each level, and each of these are at the start of the looping patterns. So IF you die, you will always respawn very near to where you died. Also, if you do die, all nearby enemies die too. So, death is rewarded with a free pass. Mario Land is a strange game. It isn’t a BAD game, but it isn’t good either. Some very strange decisions seem to have been made with regards to music, for example, the star music has been replaced by Offenbach’s Can Can music, and none of the music we associate with Mario makes an appearance. The physics are all over the place, mushrooms fly off, Mario has a strange zero gravity jump. All things considered though, it isn’t really worth playing. With the exception of Mario Bros, this is the worst Mario game and that includes all those terrible Golf spin offs. You can unlock Hard Mode once you beat the game, but this is lost when you turn the Gameboy off. Playing through on easy isn’t worth it to get a harder version afterwards. Play the far superior sequel, Super Mario Land 2. Ha oh yeah… Daisy. What a weird game. Looking at those level layouts, it’s pretty pathetic. I’ll end up feeding it to the Rage Mage.